Think of southern foods and immediately images arise of crispy fried chicken, garden vegetables stewed with savory pork, crusty cornbread served hot from the skillet with sweet butter, piles of steaming golden biscuits, and scrumptious desserts such as three-layer caramel cake, blackberry cobbler, and homemade peach ice cream. Comforting dishes such as these are why Southern food is one of the best preserved and most cherished culinary traditions in this country. Years ago these traditions were passed down from mother to daughter in the intimate learning environment of the family farm kitchen. But in today's new South, where pastures are covered with suburbs more than cattle and the agrarian families of years gone by are dispersed, time spent in the kitchen is hurried. Hands-on cooking lessons are now paid courses rather than shared labors of love between friends and family. Southern cousins, Courtney Taylor and Bonnie Carter Travis, both experienced cooks and writers, are passionate about preserving the Southern culinary tradition. Their new The Southern Cook's Handbook takes an in-depth look at the ingredients and methods of Southern cooking and offers step-by-step basic guidelines for making delicious, authentic Southern dishes. Travis and Taylor get into the kitchen with you, telling you how ingredients should look, feel, and smell. These two accomplished cooks explain all of the fundamentals and methods of the Southern culinary experience. 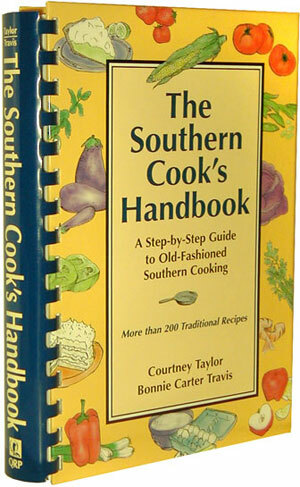 The Southern Cook's Handbook contains 200 of the South's most traditional and popular recipes such as mint juleps, gumbo, cheese grits, field peas, fried okra, pecan pie, fig preserves, and a host of other uniquely Southern delights. There is also contained a reference section with cooking guides, a glossary of cooking terms, measurements, tips, techniques, and solutions to cooking questions. Believing that proper, patient instruction and practice are key to becoming a great Southern cook, Taylor and Travis have included information that is fool-proof, fail-safe, and fun to use. The Southern Cook's Handbook is a how-to manual, a primer for the new cook, a refresher course for the old hand, and is an essential reference in any Southern cook's kitchen. 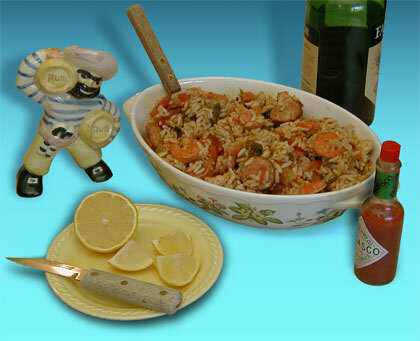 The accompanying photo is Jambalaya prepared by The New Southern View's staff following the recipe and advice given in The Southern Cook's Handbook. We consumed twelve servings of Jambalaya in record time, and recommend The Southern Cook's Handbook to anyone with a fond interest in good regional cooking. ISBN 1-893062-29-5 • 6x9 • 288 pages • illustrated • index • comb-bound with hard cover. Available from Quail Ridge Press.